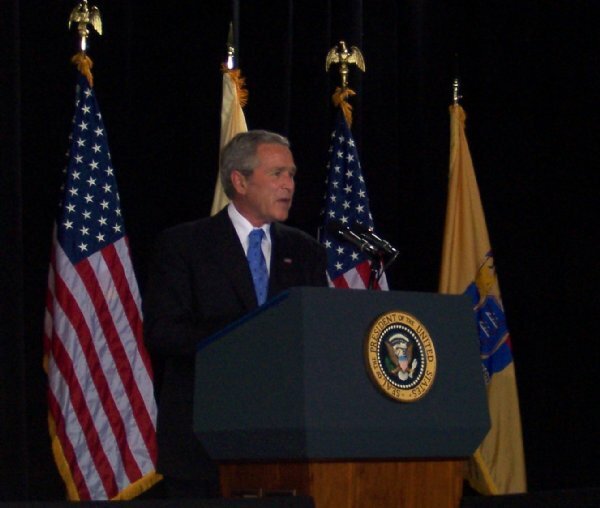 The President of the United States, George W. Bush, visited Edison, N.J., on Wednesday, May 30, 2007. 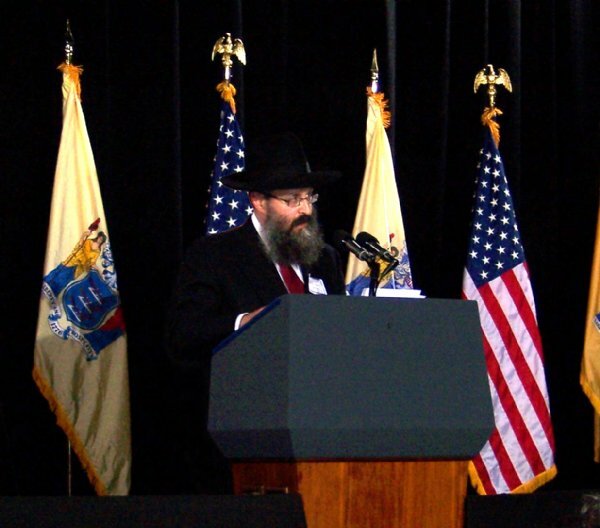 As part of this historic program, Rabbi Yosef Carlebach, director of Chabad House at Rutgers University and Chabad activities in central and south New Jersey, was invited to lead the invocation. Good Afternoon, Mr. President, Mr. Chairman, and all the esteemed participants on this wonderful day. 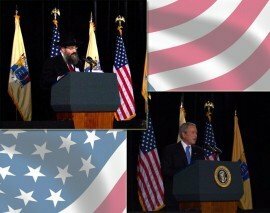 I am Rabbi Yosef Carlebach, spiritual leader of the Chabad House, the Jewish Center at Rutgers University. This was founded in 1978 by the Lubavitcher Rebbe, Rabbi Menachem Mendel Schneerson, and operates today as the largest center of spirituality at Rutgers, a place that is needed more than ever by our young men and women on the college campus. We are honored and humbled to be standing in the presence of the President. We, the People of the Book, believe in Divine Providence, and we gratefully acknowledge that it is G-d’s direct will that we, as a country, and the free world, be blessed with true leadership. Especially in a time that is challenging, here, in this country, and in the Middle East. We thank G-d today, that this country has been blessed with a President, a beacon of unwavering strength, belief, and leadership. We know that this immutable power is borne out of profound faith, hope, prayer, and trust in G-d Almighty. May You, G-d Almighty give our President the strength to lead our world. As we stand before You today, we remember this period of time, the week after the Jewish Festival of Shavuot, commemorating Your giving Your People, the Torah, the Ten Commandments, amidst thunder and lightning, 3,319 years ago. In Your book, You prescribe a place of goodness and kindness, that will governed by just and honorable laws, as we proclaim, - “One Nation – Under G-d, with Liberty and Justice for All.” This applies to this great country, but how much better would the world be, if it accepted this principal. In the Torah, You clearly have bestowed the land of Israel to Your people, a land that is more than ever in need of Your blessing to protect its people and its borders of Judah and Samaria in their entirety. We also have celebrated Memorial Day, a day that we remember our heroes who gallantly fought and sacrificed for these G-dly liberties. I take this moment to pray for the welfare of our soldiers and specifically, for Specialist Alex Jimenez, and Private Byron Fouty, and for the soul of Private Joseph Anzack, Jr. I also pray for the three missing Israeli service men, Eldad Regev, Gilad Schalit, and Ehud Goldvasser. May it be Your will, Almighty G-d, that You give strength and encouragement to our leaders. Bless their efforts to govern this land with wisdom, compassion, and good will. Send blessing and success to greet their hard work. Help us to bring true peace, respect, justice, and all its blessings to a world so in need. May G-d Almighty bless the President, the First Lady, and may G-d bless this United States amidst all good freedom loving people, everywhere. Amen.